Three-gun competitions are growing in popularity, and so the question comes to mind: how can you maximize your chances of success? Rifles are a significant portion of the competition, and a good scope can make your marksmanship even better. Check out this guide to find the best scopes for the kind of fast-paced, close-quarters shooting you can expect in a three-gun competition. What is a Three-Gun Competition? But what exactly is this great test? Put simply, it’s a series of courses where you have to shoot targets with three types of weapons: a rifle, a pistol, and a shotgun. You’ll have to take down targets in a defensive style with each weapon and you’re rated according to your accuracy and time, Faster, pinpoint shooting leads to a better end result. It’s fast-paced and offers a great chance for gun enthusiasts to practice with different firearm types. No two competitions are the same, too, so each time you run a course you’ll be on your toes! What Makes a Great Three-Gun Scope? So how can you find the best scope for this competition? There aren't many that can fit onto all three types of guns, and besides that, the time constraint means that you won't have the seconds to spare uninstalling and reinstalling scopes between the different weapons. Instead, good devices for this competition are either versatile and can be purchased multiple times for all three weapons or are specialized for their weapon type and produce great results. These are some good factors to keep in mind when choosing the scopes you need for your run. The three-gun competition is a fast-paced, close-quarters contest, so scopes with low magnifications are the way to go. Longer magnification settings won’t even be used for this type of course. A reticle that minimizes business and distractions is a must. Anything that helps you get on target as fast as possible should earn your attention. Red dot sights are a good choice because of this, along with BDC reticles. You want something that has multiple aiming points so that you can switch between closer and farther targets in the blink of an eye. Try to find a one that has generous eye relief, as nothing will end your run faster than a bruised eye because your recoil caught you off guard. Good eye relief also lets you survey the course more quickly and find your next target in moments. First focal plane scopes change size between magnifications, which can slow your progress as you move through the course. Instead, find one with a second focal plane reticle. This consistency will help you move from target to target smoothly. Now that we know how to choose a three-gun scope, lets look at some of the scopes available in the market from the above criteria. The Primary Arms SFP scope is made for rifles, so keep that in mind when choosing your gear for your three-gun competition. It’s great for rifles being used for close-quarters combat, due to its low magnification and second focal plane reticle. The reticle is balanced and sturdy and won’t shake or tremble with the various shots you’ll make during your run. The reticle also glows red and is adjustable between 12 different brightness settings. This can be of particular assistance if your three-gun competition takes you in and out of buildings where light levels can fluctuate. The reticle is powered by a long-lasting battery. The entire body is also totally weatherproof and designed for durability. This can be of great value if it rains during your competition, or if you want to get a good one for later use during hunting or other outdoor sports. Finally, its sight picture is phenomenal and bright. This matches well with the good eye relief afforded by the eyepiece. You can stay far enough away to avoid damage while still maintaining accuracy at the longer magnifications. 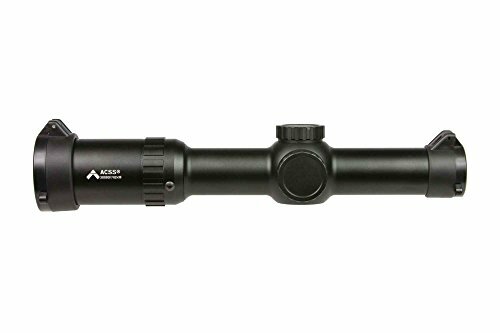 The Primary Arms SFP Scope is a great choice for versatile rifles and can assist shooting in close-range combat. Target acquisition is snappy, eye relief is generous, and the entire product is built to last for years of use. The BugBuster is a small but sturdy product that has a lot of moving parts. When they work together, the result is a fantastic scope that offers a wide variety of uses in all lighting situations. This item uses a mil-dot reticle that’s great for estimating your range to your target. This can be adjusted from three yards on, so it’s perfect for the kinds of ranges you’ll be expected to compete at for a three-gun competition. The reticle can be illuminated in red or green depending on your preference. The field of view offered by this product is very wide and comfortable, because of this, the eye relief afforded by the BugBuster is among the most preferable for CQC action in the market. The lens on the other end is protected by a flip-open cap, which can extend the scope’s overall lifespan. It’s very durable, totally weatherproof, and the sunshade that comes along with your purchase is a good addition if you live or are planning to compete in a sunny environment. The rings of the turret are detachable and the turret itself is lockable or resettable for quick adjustments. You likely won’t make use of these features in the rapid pace of the competition, however. The one flaw is that is knobs are a little bulky, especially for smaller rifles. If this product looks to be too clunky for your weapon of choice, find a slimmer model. The BugBuster provides a fantastic field of view and eye relief, making it a good choice for rifles that have a tendency to buck wildly. The entire piece is strong and functional, but a little wide at the sides due to its knob sizes. 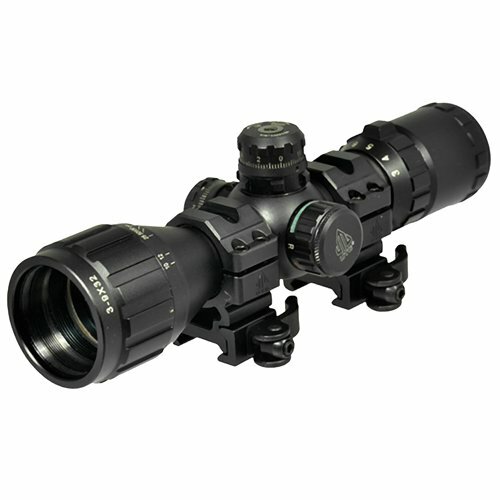 This scope is great for quick adjustments and fast zooming in on targets. It comes equipped with a lever that you can use to rapidly focus on a target in the distance. This can aid you in a competition by letting you sight-in on far-away targets faster than many others. The lever is a bit bulky and might interfere with your sight otherwise, however. It can be switched from 1-6x magnification levels, so it’s optimal for the close-quarters shooting that the competition promotes. The illuminated reticle can be set to shine in two different colors, red or green. The lens is 24mm and offers very bright sight pictures and is enhanced by the tube, which funnels light very effectively yet minimizes glare. It’s a great addition that prioritizes precision at all of its variable ranges. Finally, it’s all made from aircraft-grade aluminum that’s guaranteed to take a beating and last for years to come. You can use it long after your competition is complete. 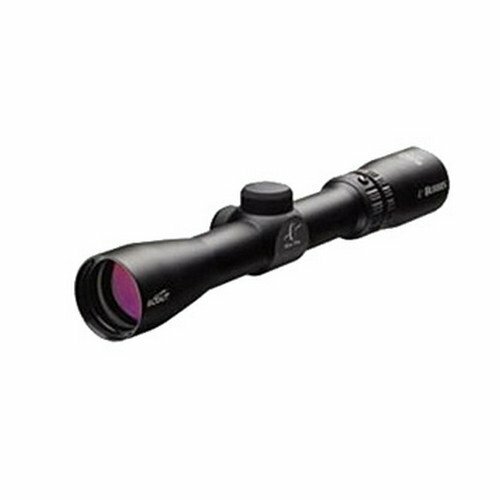 The TRU-Brite scope is ideal for competitions or courses where you plan to zoom in quickly for many targets. It also serves as an effective option that can take advantage of cloudy days or low-light conditions thanks to its highly-efficient tube and lens. The Vortex Spitfire is a perfect scope for three-gun competitions because its magnification level never changes. 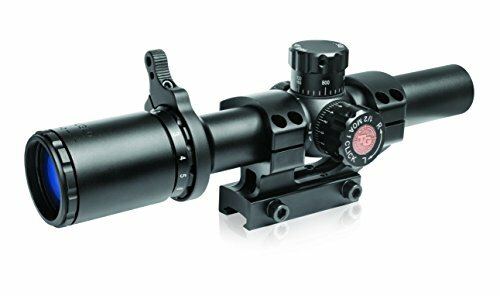 It’s locked into 3x magnification, which is a moderate-to-close range suitable for the types of targets you’ll be expected to hit during most of these courses. The lens is multi-coated and designed to reduce glare, even during sunny days. The reticle, to assist with this, can be illuminated in red or green light like many of its competitors. You can choose up to five intensity levels for this illumination. Furthering the perks of this product are the dual-height settings included with the mount. You can choose between 30mm and 40mm placements, so it will fit on rifles of all sizes and shapes or can adapt to your own head size. The eye relief offered by the Spitfire is very safe and takes full advantage of the excellent sight picture displayed by the lens. The entire piece is weatherproof and shockproof. Even automatic rifles with a lot of recoil won’t harm either the scope or its reticle, which is etched right onto the prism. The Spitfire is a very sturdy riflescope that can adapt in height but not in magnification. This is a boon in the three-gun competition, as the less time you spend messing with settings means you have more time to hit your targets. It offers a plethora of good features that make it worthy of its high price. The Monstrum Tactical is a rangefinder scope that has special notches in its reticle to allow you to better gauge the actual distance between you and your target. This can make it invaluable during a three-gun competition, as you need to rapidly hit targets some distance away. A scope like this can greatly reduce your number of missed shots. 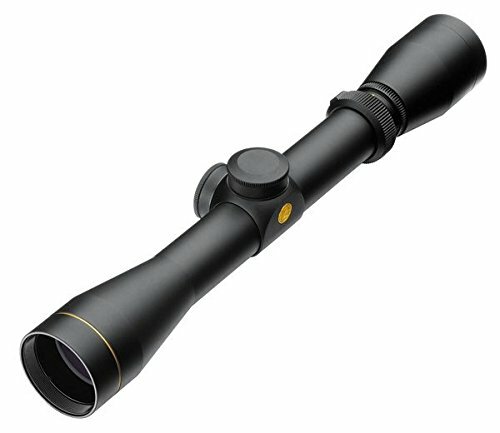 Its magnification levels are ideal for this competition, too, as the 7x magnification setting can reach out to 300 yards. This is plentiful in most standard three-gun competitions. The lens can be adjusted to be objective or AO, which can eliminate parallax and help you focus your target’s image in the scope. The reticle can be illuminated in either red or green and shifted between five levels of luminosity and the mount and base are both relatively firm and secure. The adjustment knobs aren’t super precise but they’re tuned enough to not make mistakes during the rush of competition. It’s all very well put together, made from aircraft grade aluminum and built to be weatherproof for use during any occasion. It’s an affordable piece considering all that it has to offer; the only real nitpick is that its highest brightness setting (out of five) isn’t very radiant compared to a lot of competitor models. The Monstrum Tactical is a good choice for sharpshooters or if you know that your three-gun competition is going to have some targets a fair distance out. It’s got the right magnification for closer work, too, all for a pretty low price. The Leupold VX-1 is a lightweight product that will fit in well on smaller rifles or those that can’t take a lot of extra grams of weight before you see results change. It can magnify between 2 and 7x, which is great for three-gun competitions. It’s also weatherproof and sturdy despite its small, narrow shape and size. Most importantly, the VX-1 offers a four-lens system that enhances sight picture clarity and brings you the best visual results we’ve seen on scopes of this size and price. The lenses are all multi-coated to reduce glare and to ensure that they can stand the test of time due to the scratch-resistant properties they take on. A lens cover included with your purchase helps accomplish this longevity, too. The eyepiece is a fast-focus type that’s great for snapping in and out of focus. This is what you’ll be doing for the competition, so it’s a welcome feature. Its adjusters are smooth and easy to change, but there aren’t very many of them so long-range work is somewhat limited. However, all of these features combine to overcome that minor flaw. This is an exceptional offering for lighter rifles or if you like to dart in and out of the sight in the middle of the action. The VX-1 is a snappy, smooth scope that’s ideal for competitions like the three-gun. It can cover multiple ranges and provide crisp, clear sightlines thanks to its four-lens system which promotes quality and a long lifetime of use. The Burris 200261 is a tough, compact item that is made with high-grade steel. This influences every aspect of the scope’s design. For instance, its adjusters are all made from the same caliber of material. When you switch between settings, audible, satisfying clicks inform you of your progress. This can help during the din of a firefight or competition. It’s totally weatherproof and built to last. A posi-lock security system locks it into place with its current settings to prevent any shifting or switching in the midst of your competition. If you plan to use an automatic rifle or a weapon that has a lot of recoil, you'll appreciate this feature since you won't need to worry about your settings changing as you shoot. The lens allows for rapid target acquisition with both of your eyes open; the wide eye relief is a major factor in this perk. This is great for a three-gun competition since you'll need to be alert and aware of targets popping up around you all the time. The fewer seconds spend in the scope, the better. Finally, the lenses are multi-coated to increase their lifespan and improve the sight picture they provide. With magnification levels of 2-7x, it’s perfect for the ranges typically encountered in 3-Gun competitions. The Burris is a little pricey, but it’s worth all of the cash when you factor in its solid construction and attention to securing your scope where you want it. It increases accuracy, promotes rapid shooting, and can handle anything you throw at it. If you’ve got a heavy-hitting rifle, you might consider this product. 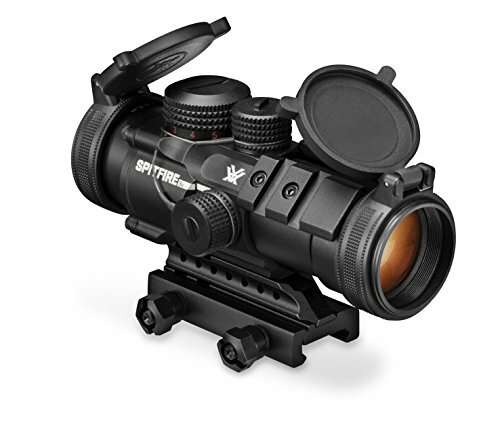 Vortex’s Crossfire II model has one of the best eye relief ranges we’ve ever seen at 3.9 inches. This means that your chances of incurring damage during firing are slim to none. Its eye box is similarly-wide and large enough to let you shoot with both eyes open. The reticle is a V-plex, multi-purpose design that’s great for hunting and competing. It’s one the second focal plane, so using it on any of is 2-7x magnification settings will net the same, accurate results every single time. The lenses are multi-coated and improved to be anti-reflective. This makes the clear sight picture even better and reduces any potential for glare you might find. Everything is made from one tube of aircraft-grade aluminum that’s entirely weatherproof. The adjusters are very easy to manipulate and change, clicking audibly as they work. Reset turrets are capped to prevent them from slipping during firing or movement. 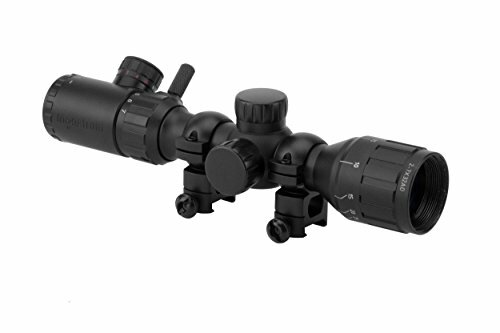 This Vortex item is pricey like its companion, but it makes up for it with its high quality and excellent optics. This is one of the best product for a three-gun competition you’ll find, bar none, and it’s far better than any of the expensive scopes that can cost upwards of $500. The Crossfire II is a versatile, adaptable item that prioritizes eye relief and has a wide eye box. It’s perfect for shooting with both eyes open and for acquiring your target with as much speed as you can manage. Good scopes for the rifle portion of your three-gun competition are crucial, every second matters in these courses, so we hope that this guide helped you find the perfect one for your weapon of choice. With the right scope complementing your rifle, you’ll be breaking records and taking home awards sooner than you think!